Another statement from Newcastle United! | NUFC Blog. Another statement from Newcastle United! Needs to clarify some things. In light of the recent bodged up statement that was released a few days ago now, the club have felt compelled to issue another brief statement to clarify things a bit more. “Thank you for continuing to buy your season tickets, and thank you all for your support week after week. We know that at a time of economic uncertainty sometimes attending games can be a struggle, we know there are more important things than football. So for a club that haven’t won a top class domestic trophy since 1955 to record an average attendance of 43,387 in the Coca-Cola Championship was stunning and humbling. “This season has started to bring about a period of stability, a sense of us all pulling on the same direction. We know mistakes have been made and we know that the mistakes may take some time to forget, but rest assured we are trying our best to run the club properly. In the spirt of pulling together, we feel that we have a duty to be open and honest. “Just as this is a different Newcastle from the club that were relegated a year ago, it also a very different environment. With that in mind we will attempt to back the manager in whichever way is possible whilst retaining the integrity that will se us become a much more sustainable club in the future. “In the meantime, we want to build a new Newcastle, if you will. We want this to be a Newcastle you can be proud of. A big part of that, as always, will be determined by what happens on the pitch and all players will be reminded of their responsibilities to you, but it also means focusing resources on our Academy structure. “For far too long, this region has allowed its be better players to leave and we have to put a stop to that. We have an academy that is producing talents that are intersting some of Europes biggest clubs. For that reason we will be looking to integrate as many of these up and coming players into our first team squad as the manager believes he needs. So that was my attempt at it. I’ve not covered all of it and I’ve tried to keep it brief, but I reckon that would have been enough and would certainly leave fewer questions being asked than what there is currently. In keeping in the spirit of things, if you have any queries regarding my attempt at a statement, the answer will simply be…..
Worky – Can you take this down for a bit and put it up later? I don’t know how to. I saw you had something planned but weren’t writing at the time so got this out. Divven’t worry, Toonsy. I’ll send you an e.mail. Looks like an appeasement statement to me.Does anyone believe anything that ashley says anymore.not me. If the extra revenue is not being used to pay back the debt, then where exactly is it going to if there are no plans for capital outlay? JJ – we either breakeven or spend it on transfers and report a loss for roughly the amount of money we spend. Probably somewhere inbetween those two options. Ye, at the very least we should break even – but then why the five year plan – why not the one year plan? Maybe a top of the range blow up doll with real hair.no one knows what the f@@k is going on. they are just a bunch of cnuts. if he wants to take no money out of the club, and he does not want his loan repaid. so, this being the case why can we not buy any players when we lost 37 million last season but this season we get 60 million extra… to me the basic math means we can buy some dudes! i think ashley has a serious issue with standing straight like a man and saying the truth. ashley for prime minister i say. I’m a sports journalist by profession and my proof reading skills are pathetic. As you would have picked up by most of my posts. I’m English first language – yet sometimes when I read my own posts I figure that most people think I’m a Bulgarian who has picked up the English language watching Borat movies! JJ – it doesn’t mean there can’t be revenue expenditure. For example, if they forecast we’re breaking even, they could use a portion of that to invest in players. E.g. the £15m-£20m from season ticket sales could go on players and would show as our loss for the season. There would be other reasons (tax etc) for doing this and by all accounts is how he runs other businesses. JJ – I blame 2 things. Capital money is money put directly into the business by the owner. No capital outlay or whatever was said could mean that Ashley is not puting any of his ‘own’ money into but players. Players will be bought using tv money, prize, sponser money etc as well as any sales. Ashley will be paying off the debt over the next 5 years using this money also, just have to get the right balance to take the club forward and pay off the money owed to whoever. Don’t know what people think of that. If I am right, the whole thing could have been worded better, but at least its something. “JJ – I blame 2 things. Would I change it? Nah.. It could mean a number of things – but we’ll only know by the end of the transfer window. Could we sure as hell arn’t going to be explained it by the board. Journalist: Eh, excuse me Derek, can you explain why your statements are more cryptic than a Nostradamus quatrain? See what I mean Toonsy? I really do pity my sub-editor. Suppose that’s the best way to look at it, see what has happened by 31st Aug. I was just going back to my accountacy days with regards to capital. Lets just hope some players will be bought. Doesn’t have to be big names or massive cost, just good enough to keep us up and help us stat to progress again. Simon the second statement would lead you to believe the orignally Ashley loan remains unpaid for now at least. I expect when the wage bill decreases and the young men come through the ranks, we will be hoping to massage that operating loss further and by then breaking even could include repayments on that loans. You’ll appreciate there’s a whole lot of wishful thinking on their part in amongst that lot. And of course whether you choose to believe the second and slightly more definitive statement would depend on whether you trust the board any further than could chuck their big bag of gaffs. Going to be a lot of wishful thinking I reckon, lets just hope some of it comes off. It only means one thing, JJ. But it doesn’t matter what they say, people with their own agendas will seek to distort it and confuse people. They only released this statement because batty slashed ashleys tyres. I heard heard Batty attacked Ashley with soiled bedsheets. lads the bottom line is! like i always said nobody would be giving him his money back just himself. this guy paid all that what was oweing out of his own pocket so we dont own anybody anyhthing. so we are going to be stuck with him nobody will buy newcastle unless he takes a hit on us.if they do we will be debt free club to any new owner. god write up by Ed this like, puts the ‘no capital outlay’ issue in more understandable light for us business novices. Also, makes sense, as we have seen with our our other signings. Why have they felt a need to clarify this point? I don’t recall much media comment regarding the loan repayment. All the comment has been about the ‘capex’ sentance. Why haven’t they clarified this as there’s many different definitions as we’ve seen. Could it be because that’s a negative story? Anyway fair play Ashley for not takin the loan back. Why aren’t we going to be breaking even sooner than five years from now then? Because it doesn’t make as good a story? It’s not the most sensational part of it. Which one causes most controversy and a bigger reaction? Hitman it seems that way, I have said right after the KK fiasco that I dont think there is anything that MA could do better than have a questions and answers session with the Fans. as in so many ways he comes across as a complete tool, but I have allways thought that he bought the club for all the right reasons. More so as the end of this season he seemed to be starting to get something back from the club as he looked to be enjoying himself. I just wish he would meet with the fans as I think a lot of people would think different of him as lets face it the statments dont clear much up. Lads I think there is so much you can find out about a person when ye can see the whites of their eyes when your taking to them. Although I dont think the debt is wrote of completely. I think it will just not have to be paid untill the club is sold and not before it. Now I know why they don’t like communicating with their customers. So if Ashley does`nt want his hundred million back, can I have it, please ! Lets get this straight, I think what he means is he does`nt want it back right away, but he does want it back at some stage. Face it who in his right mind, (except Andrew Carnegie and it`s debateable whether he in fact was) makes a gift of one hundred million. ….and that we are sometimes subject to crude stereotyping. in this blog we have been subjected to just crude typing ! What are you like on Heisenberg’s Uncertainty Principle, Hitman? It may be time for another clarification, as i am non the wiser, in fact becomming more confused with this issue. Can anyone explain in plain english what the f**k`s going on ? Well my understanding of it is that Ashley doesn’t want his money back, we’re not spending any money on new players, but we might be spending money on new players, might be paying for it all up front, or might be doing it in installments. Oh and the board/club won’t be making any comments about anything, especially with regards to press speculation – Apart from the two comments in the last 3 days. “It may be time for another clarification, as i am non the wiser, in fact becomming more confused with this issue. 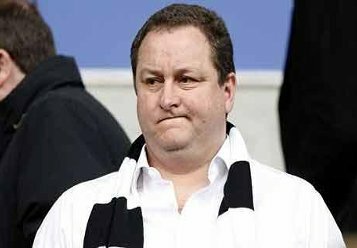 Mike Ashley isn’t looking for his loan to be repaid anytime soon, and the Club will not be using Capital Expenditure to be paid over many years to go on a massive player splurge to buy Messi, Ronaldo and Kaka. Is that simple enough for you yet, Statler? Oh and David Cameron is the new Prime Minister of the United Kingdom! On meeting the fans, think he done done that, remember him in with the fans and buying drinks doon the toon. Afraid the St.Kev. incident, blew it for him big time ! Could he ever recover and be a Geordie hero, hey nowt`s impossible, improbable, think so! Toonsy,as the league football season has finished and in view of the grammatical soul-searching views being expressed on this blog. How about a competition for spotting the sum total of errors in the various comments. Be a bit like guessing how many sweets etc in a jar at the local fete. There probably will still be something I’ve mist. Whaaaaaat ! your saying were not signing Messi & Ronaldo ? Thought it was a done deal ! Big Dave/Chuck/others, I’ve said several times given the weft and weave of fate and the future, do not be surprised if somewhere along the strange machinations of the universe that we aren’t singing Ashley’s praises and given him the freedom of the City. JJ never mind Nostradmus what about the predictions of Mother Shipton and her mention of a gargantuan pie eater who arises from the Ashes (eh) of the Black and White Phoenix to save the tribesmen of the NE eastern provinces. Serendipity or what. Worky – yes. He’s been to see the queen to ask if he can form a guvnor as he intends to form a collision with the Lib Dems. Yeah well you escaped light, we had George f*****g Bush for eight years, think yourselves lucky! Look Cameron`s obviously a jerk, but he does`nt have much of a mandate, what happened, he do a deal with the Liberal-Dems. And who would want to be in power when the economy is in the dumpster. Can somebody find out what Big Willy`s on, certainly sounds serendipitous ! OK outta here Amstel time in the City ! later. I have a friend who can confirm that. Any deal with the Lib Dems wouldn’t last for very long. Conservatives need a majority because everyone else hates them. Try a few Brooklyns instead. So I wonder if I have got it right Ash doesn’t want his money back until he sells the club. But he is not taking anymore money out of his pocket to buy players, But if we can afford to buy players within the yearly budget ( money coming in for the year ie tv revenue, season tickets, @SJP sponsership etc)we can ?? Roughly, Dave, and no more significant debt to third parties either (as oppsed to Ashley debt) in long term Capital Expenditure, or as he put it, “Capital Outlay” which is the same thing. Most of the confusion has been exaggerated by journalists and fans with a grudge. workyticket > Most of the confusion has been caused by journalists and fans with a grudge. I dont like some of what Ash has done. But I can honestly say I dont have a grudge, but after the official statment 1st came out I thought the worst. Because of the wording in the statment it could be interpreted in so many different ways. As I said I wish he would get someone good at PR it could save him and our Club so much grief. On a different note it was good to see these words from Andy over his link with Stoke. Carroll insisted: “I think most people know that I don’t want to leave. It’s always been my ambition to play for Newcastle United and score goals at St James’ Park, and that’s what I have been able to do. Well someones got to do it, Worky. Their all as bad as each other at the end of the day. I have a theory on MP’s – they go to Westminster with good intentions and get fed up of fighting against the tide and think ‘if you can’t beat em, join em’. Coming third then missing out in the playoffs must be fugging agony. “Well someones got to do it, Worky. I share your cynicism mostly, Stuart, but I wouldn’t generalise, as there are always exceptions. My local MP, Jeremy Corbyn, is a good man. I couldn’t bring myself to vote for him as I’d rather be skewered than vote for either ‘New Labour’ or the Conservatives! yeah just think that could of been us tonight getting beat off blackpool unlucky forest come on the toon come on sir chris hughton you miracle worker start working some magic in the prem howay nolan enrique spiderman lets six point them makem bastards toon army!! awesome for blackpool… what a story, their last 4years! He’s moved in already??! A bit much! the broons are in the shelter!!! i hope they’ve got a new bed in there! A bed big enough for mr & mrs blobby & mr & mrs pleb, i mean clegg. big dave , i think the broons have got a hoose next to Oor Wullie ! Joe Hart has been fantastic in the top flight. The England spot has to be his with James as back up. What Robert Green is doing in the team, I’ll never understand. I am Scottish so I don’t particularly care but I like to see players who deserve caps get them. It makes you wonder why Lee Camp of Nottingham Forest was talked up for an England call up this season and again during Sky’s commentary for the play off match tonight yet Steve Harper is totally forgotten, despite having the best goalkeeper season in all of England. get to bed mate you sound too focussed at 3 in the morning !! Great Both Colo creamy and Jonas included in 30-man preliminary squad. I don’t, they should both stay at home lol. So, Worky, Ed’s now doing ‘god’ write ups? He’s obviously elevated in status eh? Dis somebody say something about proof reading? Great stuff and I think we’d all appreciate dropping all this speculation about spend or no spend, Ashley communication, confusion etc. As far as I’m concerned, as long as Chris Hughton knows what he has or hasn’t got to play with, that’s fine by me. Why do Toon fans get so hung up on speculating what is, may or may not be? It’s a total waste of time and energy! Lesh @ 91….. Dis somebody say something about proof reading….. Dis? Dis? Dis = Did! Whoops, a classic case of the biter bit. Ouch! Erm…isn’t that George Culkin’s statement you’ve put up there? aye it is his ‘piece of work’. Just goes to show how crap englands keeper situation has become. Joe Hart is by far the most talented keeper in the country. Wouldn’t have any problem playing him either – He’s ultra confident. We’ll probably revert back to calamity James though. Groveling apologies Worky and you’re dead right about my proofing – see my post @92. There’s humble pie all over me gob! The press seem to be as confused as me. Ok, so we know he’s not calling in the £111m loan. What about the other £70m loss, most of which we have to assume also came from Ashley? Is it this that he’s wanting out? If so, that would explain the 2015 target. So confused, and so wanting a decent comms man at our club. I honestly believe that the plan they have in place is probably very sensible and justified; I just despair at their inability to convey it in English. Ho hum. Happy for Colo, though; shame it’ll generate shedloads of interest, but there ya go. Let’s hope he and Jonas go to SA, play well but the Argies get knocked out early due to other players’ mistakes. Oh, and a handball from Henri. Perfick. Whumpie, my reading is that he wants nowt out in the short term. I believe that over five years he’s aiming to have the club clear its overdraft with the bank (c£20m) reach a position where we don’t see the books showing a loss – breaking even on revenue. No, they are just deliberately trying to confuse you and make you panic to sell stories. They know that many Newcastle United fans are pretty clueless about financial matters and they exploit that. This fella certainly isn’t clueless and he’s struggling to make any real sense out it all. Totally off topic but neverthelss ……. No offence to any of you blue-bloods out there!!! Ays Hitman, Worky’s already turned down an approach from Camerclegg! What supporters of ANY CLUB know all the financials of their club? Why do we & the press mongs seem to have to go over ours continually? You’ve read the statement, understand/don’t understand, whatever……..Take a business course if you’re so inclined. I know a hell of a lot more than you, hitman. F*** loads of offense to blue-bloods everywhere! In fact, death to ’em, of the slow & painful variety. My Grandmother was a “blue-blood” as you put it, Clint. She and my Grandfather were penniless and worked in the Circus and on the fairgrounds. They both died slow and painful deaths eventually, as most of us do. My grandparents were steel workers & if they’d been ‘blue-bloods’ ‘I’ woulda killed them, after torturing them. No. My family were circus people and eventually Showmen, until they made their fortunes and settled down. They are not the same as Romany people. Showmen and Romanies often used to fight like cats and dogs. My mother used to tell me about how she still got the same prejudices though. Clint, you think that people should be tortured and killed because of who their parents are? What about Tony Benn? He’s a blue blood. just who they vote for. Clint, bigotry and prejudice is never right. You should know that. It just ruined me birthday man. Clint, Was Margaret Thatcher a “blue-blood”? Or was she Grocer’s daughter? I’ll be at the ‘witch’s dead party’ in trafalgar square when she kicks the bucket. Are you coming? Perhaps it’s time to call time on the politicals otherwise someone might just venture onto eggshells as it were! But saying that my grandmother deserved to die a slow and painful death is OK? I said that the other day, and nearly got hounded off here! If it’s any consolation worky, i include my own in that. But seeing as they’re all long gone, i guess they’re safe. Providing we don’t do a ‘Cromwell’ on ’em. Worky, No it’s not at all ok – it was that that drew my comment before things got a bit too personal. No of course you weren’t, hitman, and I was having a dig at you when I said I know more than yourself about finance. I was simply stating a fact.